Time: Registration and coffee from 8:45am to 9.30am. Conference starts at 9.30am and ends at 5.45pm. We are delighted to receive support from The Prehistoric Society which has enabled us to offer a reduced ticket price to full-time students. Professor Alice Roberts is giving our keynote lecture, ‘Tamed: Three Species that Changed our World‘, and is joined by a plethora of speakers considered to be Palaeolithic royalty. Chris Stringer will describe current theories and evidence about human evolution, and Nick Ashton will present the amazing results from recent work at Barnham in Suffolk. They are joined by Steve Mithen presenting evidence on late Pleistocene and early Holocene hunter-gatherers in western Scotland, and Vince Gaffney illustrating the stunning results from the Doggerland project. 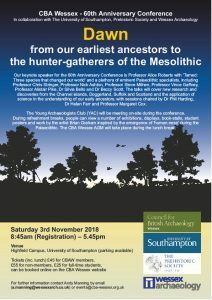 Alistair Pike will provide an overview of the role of science in the study of the Palaeolithic, whilst Dr Beccy Scott will describe the fascinating research on the Neanderthals of the Channel Islands and Dr Louise Humphrey will introduce a more exotic flavour with research on Later Stone Age hunter gatherers from Morocco. Dr Phil Harding joins us as session chair, together with Dr Helen Farr and our own Margaret Cox. There will be relevant exhibitions, displays, book-sales and posters for you to browse during refreshment breaks, and the CBA Wessex AGM will take place during the lunch break. 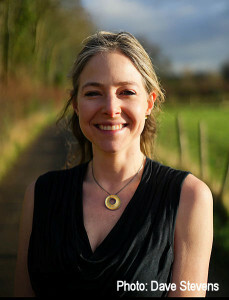 Our keynote speaker, Professor Alice Roberts, is hoping to be doing a lunchtime signing for her ‘Tamed’ book (click for details). This year will also see the introduction of the CBA Wessex student poster competition, and we await their contributions with interest. The artist Brian Graham will be showing some of his amazing work inspired by the emergence of ‘human-ness’ during the Palaeolithic. You can download presenter and lecture details here. Directions and parking available here. (All parking shown is free on Saturdays). *Please note whilst we endeavour to keep to the published programme, the programme may be subject to change due to factors beyond our control.